The entrance to our park is located on Highway # 6, just three km south of the Chi-Cheemaun Ferry terminal at Tobermory harbour. Take Highway # 6 north all the way to the campground. Turn left into our driveway. Take Highway # 21 north past Southampton to a small crossroad community called Alvanley. Turn left onto Bruce Side Road # 10. This is an excellent paved road and very straight. It will bring you to another small community called Hepworth where you will pick-up Highway # 6. Continue straight on until you get here. Remember that Highway # 6 ends just three kilometers past our driveway, so even if you miss our signs, you can only go three kilometers to the water at Tobermory. Exit the ferry Chi-Cheemaun at Tobermory, and stay on Highway # 6 for three kilometers. Watch for our signs on the right (west side) of the road. 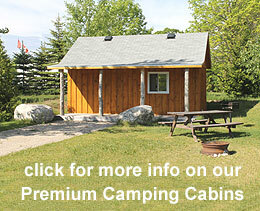 Our campground is located at the Tip of the Bruce Peninsula on Highway 6, just 3 km south of the harbor of Tobermory.